Designing a Parti-gyle brew day. This is not my usual brew day recap, I’ve planning on brewing a big imperial stout, and I wanted to use all the grains we were putting in the mash tun to create two beers instead of just one. This calls for leveraging the age old Parti-gyle technique. While the technique is old school, I’ve yet to find a modern tool that can design a parti-gyle recipe. So I’ve worked to design an imperial stout / sweet stout parti-gyle set of recipes levering BeerSmith and some other online tools and charts. I’m sharing the steps I used, hopefully these notes / methods can be useful for someone trying to do the same in the future. For this brew day I will be using three recipes, the Mash Recipe, Runnings 1 Recipe, and Runnings 2 Recipe. The mash recipe is used for designing the full mashing grain bill, full runnings volume, mash schedule and strike water calculations. This recipe is scaled to be the full volume of your two party gyles. I simplified my base recipe by moving the steeping grains to the Runnings 1 recipe. This will allow us to differentiate these two beers creating much different specialty grain beers. The Runnings 1 & 2 recipes are used for boil timing, specialty grain additions, IBU calculation, hop additions, and fermentation design and logging for each of the separate beers. How I designed the mash recipe. First start the recipe with your desired full runnings size. In my case I want 6g of imperial stout, and 12 gallons of sweet stout. I also knew the grain bill percentages, and desired gravity of the preboil for the primary imperial stout recipe. If you only have an OG to start with, you can use the boil off calculator linked below to determine your desired preboil gravity. Once you have that, you can look up the recipe original gravity in this Chart. With the Mash recipe gravity was determined, you can built a recipe using the grain proportions feature of Beersmith, then adjust gravity to scale the OG to the ‘Total batch gravity’. Once you have the grain bill scaled, you can determine your mash schedule. 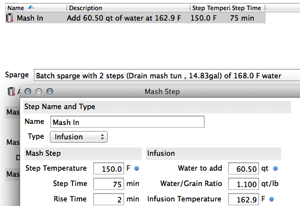 For my Mash recipe I selected a mash profile that had my desired mash temp, and style, which was ‘Single Infusion, Light Body, Batch Sparge’. I then set the following on the Batch sparge profile. Check Drain mashtun before sparging. 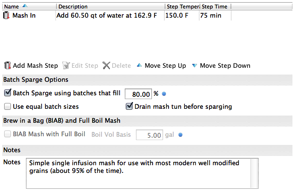 Next you need to configure the mash steps in order to get the desired first runnings volume. I am using a ⅓, ⅔ parti-gyle, so I need to mash in with enough water to collect 1/3 of total runnings. Open the Mash section of the recipe, then open the mash in step, and adjusted the water to grain ratio to calculate a ‘mash in’ volume to generate my desired first runnings volume. 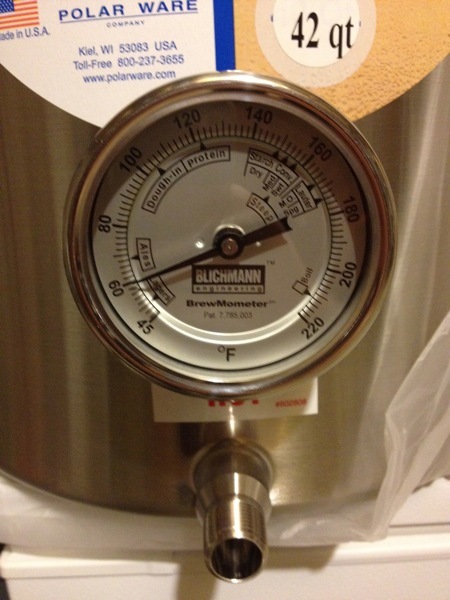 For an 18g batch, the estimated pre-boil volume of the full batch is 23.35. 1/3rd of that is 7.8g. You will likely need to reduce the ratio so that the total strike water volume = Runnings 1 preboil volume + dead space + grain absorption. I set my mash ratio 1.1 :1 qt/lb ratio which is a _very_ thick mash, and may result in a decreased efficiency. Please note your ratio will vary, this step may take some adjustments to get right. 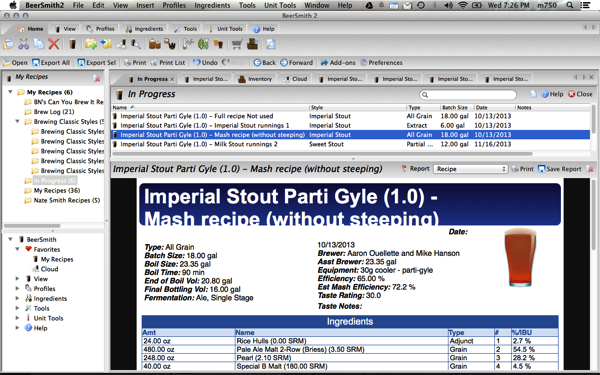 Once you have Mash Recipe defined, you can go work on your runnings recipes. These are much easier to deal with. There is only trick I used was to approximate my runnings with ‘extract’. Using my boil off calculation, and Brewers Friend boil off gravity calculator, I was able to determine my expected gravity post boil. To represent this amount of extract in the recipe, I added pale extract to the recipe, then I scaled the gravity to match that post boil gravity. To properly estimate color, you simply adjust the SRM of the extract to match the SRM value provided in the third chart provided by Randy Mosher. In summary, I wasn’t able to do this in any of the modern brewing software natively. It required multiple tools, scaling, and tweaking to get my recipes designed to where I believe they are correct. I do not know enough of the brewing formulas to validate my work. I look forward to brewing this brew day to see if all my work to get this on paper will pay off. I’ve planned an early December brew day with Mike (Bow bog brewing), which will make my 12th &13th beer of 2013. Also, I found Kai’s spreadsheet very late in this process, I’m not sure I’d have bothered to do any of this if I had found this earlier. Randy Mosher’s Parti-gyle article and chart for runnings gravity and color. Article and Podcast from beersmith about Parti-gyle brewing. Kai’s Parti-gyle excel spread sheet and guide.